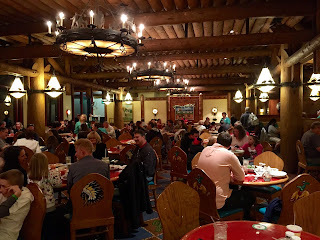 We had the chance to eat at Whispering Canyon Cafe for the first time last night, and we enjoyed it very much. Located in the Wilderness Lodge, this restaurant is known for its lively atmosphere and country style cooking. The most fun occurs when you ask for ketchup. Your server has everyone at your table stand up and yell "We need ketchup." Whoever has ketchup is required to then run the bottles to your table. Once we had the ketchup, it became our responsibility to deliver it to the next table who yelled for it. This was just one of the things that makes Whispering Canyon a fun place to eat.